1 Do You Even Need An Electric Snow Blower? The first storm of the season has come and gone, and now it’s the season of snow blowing. Unless you’re excited about a snow shovel exercise program, nobody really wants to do the backbreaking job of shoveling the driveway! And yet, you might be asking what snow blower to buy, or even if you need one in the first place. Don’t worry, I can help. Here you’ll find all the information you could ever need, along with my list of top rated electric snow blower recommendations! Do You Even Need An Electric Snow Blower? That really depends on how much snow you get. If you get just a couple inches or less a year, you probably don’t need a snow blower. There’s other options for moving snow then… maybe a power shovel, or an electric snow thrower. If you’ve got more than that, an electric snow blower might be the perfect thing for you. There’s a top limit, too. If over 10 inches dumped on you at once, you’ll need to do multiple passes to get it moved. An electric snow blower can be roughly equivalent to an entry-level single-stage gas thrower. It can handle good drifts, but not all at once. So when the snowplow dumps a mountain at the end of your driveway, expect it to take a few passes. You’ll notice that I’m throwing two very similar-sounding terms around. 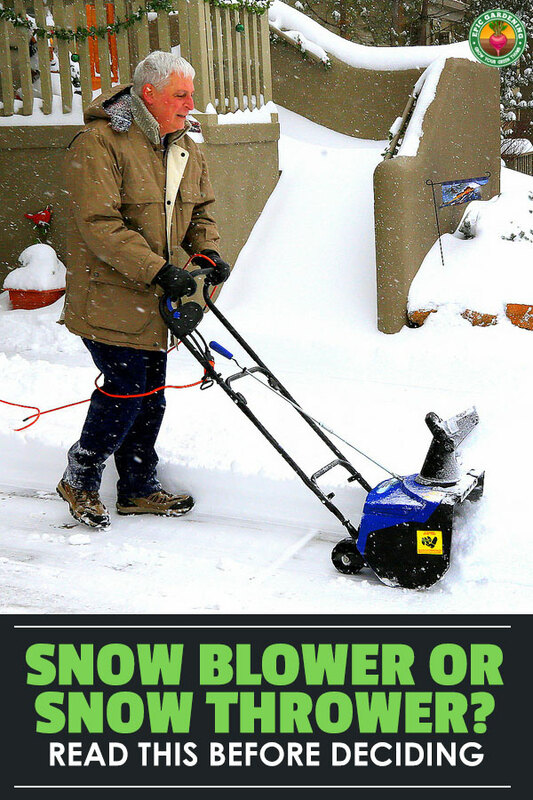 Since it can be confusing, let me explain the difference between an electric snow thrower and an electric snowblower. An electric snow thrower is intended for people who have low levels of snowfall each year, but who have reasons to avoid using a shovel. It’s about the size of a standard lawnmower, and only works for smaller areas. Someone who only needs to clear the path in front of their house, or perhaps the average suburban driveway, can benefit from an electric snow thrower. In comparison, an electric snow blower can launch the snow significantly farther out, and can handle larger areas. A good snow blower can handle eight inches of snow with relative ease. However, you do have to push an electric snow blower, and it can be a bit rough to manhandle it through the thicker drifts. Snow throwers tend to be lighter-weight and slightly easier to maneuver than snow blowers. If you have a long driveway, though, you’re still going to want that snow blower. Now, what if you’re only doing your deck, and it’s low-snow conditions, maybe four inches or so? In that case, you might want to consider a power shovel. While these do save you some backbreaking labor, they’re not as effective for large spaces unless you’ve got time to spare, as they tend to have a very narrow mouth and not anywhere near the snow-moving capacity. When you buy electric, you’re saving yourself from the fumes and the hassle, but you’re losing a little power. Gas snow blowers seem to be notorious for having carburetor issues. If you use old gas, or if any non-gas material or particulate gets into the gas tank, the carburetor can get gunked up and require repair. They can also be finicky, and might not start as easily in inclement weather… which, as you can imagine, isn’t ideal. But they go through snow with ease, and can handle a lot larger drifts than the average electric model. By comparison, an electric blower might be hard to push through the pile that the snowplow always leaves at the end of your driveway, but you won’t have to find a carburetor repair guy when your snowblower decides to stop functioning. For many people, the convenience factor plus the lack of necessity for a larger model makes electric blowers appealing. Many stages of powder snow are ideal for your electric snow blower. Thin crusts over the surface of the snow can also be handled, but thicker or hard-packed crusting might be tougher to chew through. If you have wet or slushy snow every storm (for instance, in the mountains of southern California), an electric snow blower just doesn’t work as well. This is because soggy snow tends to gunk up or get caught in the internal workings, jamming your machine. At that point, it may be time to look at a gas snow blower that can handle heavier duties. Let’s go over a few of the brands who produce electric snow blowers and snow throwers. Some of the names may be familiar to you, but others might not. Ego brings to the table their POWER+ series of cordless electric power tools, which they spent ten years developing. The company claims that it’s the “first line of cordless outdoor power equipment with the power and performance of gas, but without the noise, fuss, and fumes,” and there’s many people who’d agree with that sentiment. They’ve been around for about twenty years, but the POWER+ line of Ego snow blowers is constantly evolving and staying current with technology. When compared to Ego, Toro is positively ancient – they celebrated their first hundred years in 2014. While Toro snow blowers are among their extensive list of products, the list hardly stops there, covering all manner of turf management and irrigation options as well. As a result, they’re one of the leading names in the industry to the present day, and they’ve earned many awards for their assorted retail and professional grade products. Founded in 2004, SnowJoe’s very first product was the Snow Joe electric snow shovel. 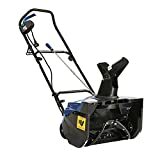 Since then, they have expanded out into all manner of snow-management products including a range of Snow Joe snow blowers. There’s also a line of SunJoe outdoor products as well which has garnered great praise. In 2007, GreenWorks was founded by its parent company Globe Tools. GreenWorks brought out its first line of corded power equipment in 2010, and followed that up in 2011 with a line of lithium-ion battery power equipment. They don’t currently produce a GreenWorks snow blower, but they do have a line of power shovels and snow throwers which are quite well-received. There’s a reason that so many people are singing the praises of the Ego model SNT2102. With a chute that can swivel 180 degrees to aim the snow in the direction that you want it to go, and a long-running 56-volt battery, this machine is almost the same functionality as a gas-powered model. It can lob snow up to an amazing 35 feet away, enabling you to clear your driveway or walk, deck or patio with ease. Because the intake height is 13 inches, you can take on most normal snowfalls with ease. However, if you’ve got a thick accumulation of snow left behind by the snowplow, it can be removed by taking it in 10-inch heights at a time. Especially relevant is that it comes with a five-year limited warranty (and 3 years on the batteries). This guarantees you’ll be able to use this Ego snow blower for a very long time. All things considered, I can’t help but to make this my top choice for the best electric snow blower. Features: 160 degree chute. Lightweight and easy to maneuver. While there’s always a little bit of annoyance when using a corded model, especially when you need an extra-long cord to reach, it has the benefit of being able to run continuously until even the largest job is done. The Toro snow blower is a smaller machine than the Ego, and has a few more limitations due to that. Having said that, this machine can handle a wide variety of snow types with relative ease. Because it’s smaller, it’s also significantly more lightweight, which helps with maneuvering. With anything deeper than about eight inches, you might have to do multiple passes to clear the snow. Different snow types will throw at different rates with any snow blower, but this one consistently lobs even soggy snow at least fifteen feet, with a top range of about thirty feet. As a result, this is definitely the best corded snow blower available. 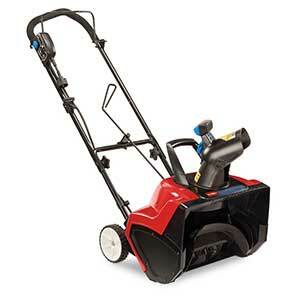 This Snow Joe snow blower is a step up from the Toro corded model, but a step down from the Ego snow blower. While it has a comparable weight to Toro’s model, and it handles a comparable depth per pass, it’s still less than the extra two inches that the Ego can offer. Still, there’s nothing here to sneeze at. With an average 50 minute run time before recharging, the SnowJoe snow blower eliminates the cord requirement. It seems like other than its cord-free nature, this model is in essence the same as the Toro until you add on the auto-rotating chute and the headlight. Being able to clear snow after dark is essential in the dead of winter, especially if you get home from work to discover the plow’s blocked the driveway. 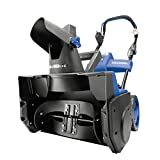 This is a solid and dependable choice for best cordless snow blower. 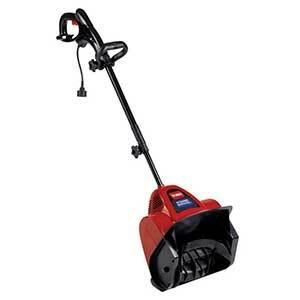 This SnowJoe snow thrower might as well be a full snow blower, as its power is comparable. Unlike its snow blower relatives, it includes a scraper on its base which makes it really only effective on flat surfaces such as driveways, walkways, and decks. Gravel pathways do not do well with this model as it’ll just pull up the gravel with the snow. However, its scraper won’t damage your flat surfaces, which is important. For what it is, this snow thrower is phenomenal. The chute can not only be turned 180 degrees to aim the snow away, but can be adjusted to angle the height of the snow spray. It’s perfect for quick snow pickups in small to medium-sized areas. As a result, I have to give this snow thrower a high recommendation. It’s about as close as you’ll get to a snow blower in a less expensive package. So, you’ve read this far and have realized that maybe you don’t need a snow blower. You might not even need a snow thrower. What now? Is it time to choose the right traditional snow shovel or invest in a large supply of ice melts? Take a look at this power shovel. A super-lightweight 12.5 pounds, it easily tosses snow aside and spares you from the agony of traditional shoveling. While it only throws straight out in front of the unit, it can toss it up to 20 feet away, which makes it nearly perfect for folks who really just need to clear their walkway or deck on occasion. While it has a potential clearing depth of up to 6 inches, it seems to work best at about 4 inches. Sure, it has its limitations. But if you don’t have a huge space to clear, and you want to save your back, the Toro Power Shovel is the perfect choice. 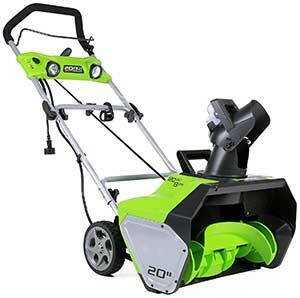 This is my runner-up to the SnowJoe snow thrower, and I’m including it because GreenWorks makes good products for a great price. It’s also wider than most of the snow blower models I’ve profiled so far, with a 20 inch width. If there is one solid complaint, it’s that the SnowJoe model can take deeper bites out of the snowpack. Comparatively, this one takes about a 6 inch bite with ease, but much deeper and it has to really work at moving the snow. I personally prefer cord-free models over corded ones. But if the SnowJoe isn’t available and you want another inexpensive option, this GreenWorks snow thrower will do the hard work for you. So, have you figured out what you need in terms of electric-powered snow movers yet? Whether you opt for an electric snow blower, an electric snow thrower, or an electric power shovel, these are great options that keep you away from the gas fumes and carburetor clogs. How deep does the snow get, and which would you choose? Feel free to share your stories! 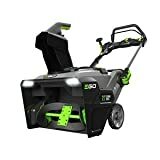 Poulan Pro 40-Volt Lithium-Ion Rechargeable Battery Snow Thrower. Thanks Joseph – I personally go with the Snow Joe, but I’ve heard some good things. I haven’t personally tested it though, so I can’t vouch for it myself!